We first head to Flemington on Saturday where Lord Barrington kicks off proceedings in Race 7 with Jake Bayliss aboard jumping from barrier 9 in the York Racecourse Grand Handicap over 1200m. Fitness may be question, however on the back of some terrific lead-up work and with a claim advantage, the son of Darci Brahma has earned his crack at this. And not too often has this consistent galloper failed to please. In Race 9, The Curragh Grand Handicap, we have two lining up for a start over 1600m. 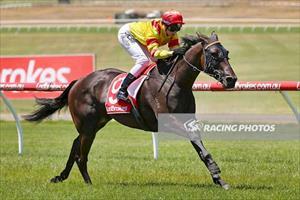 Stakes placed War Legend starts from barrier 7 on his second start back following his impressive win at Sandown. He is up in weight and faces a strong field but we are using the claim with Jake Bayliss aboard. The son of Rip Van Winkle is in outstanding order and keen to get the job done. He does face some competition in the form of stable-mate Strike Force who’s in great form and jumps from barrier 13 in the hands of Patrick Maloney. Again, this is a horse who’s in excellent order with the gate speed to enable Moloney to place him handy in the field to be a genuine threat in the race. Then we cross over to Rosehill Gardens for Golden Slipper Day where we have one runner – Vandancer (pictured) – in the Group 3 Bradford Black Epona Stakes over 1900m, a trip which is right up her alley. Track conditions look like coming up a Heavy 10, though that shouldn’t be too much of a hindrance for this Savabeel mare who has already notched up a stakes placing through heavy ground. It remains to be seen whether the barrier draw in conditions will serve her well; however, she does have the gate speed and we anticipate Tommy Berry guiding her nicely to the best part of the track to be up there in the running. Moving into Sunday, we head over to Yarra Valley where we have two runners. The improving Dodge City lines up in the Knox Audiology Hearing Maiden Plate over 1950m with Patrick Moloney aboard. Form does run through this field, though if the son of High Chaparral can get some luck from the barrier 9 draw and put his best foot forward in the running, this does look like a race this up and coming stayer can win. Second on the Yarra Valley programme we see Araldo Junior run in the Jack Hirsch Memorial Yarra Valley Cup over 1950m under the guidance of Patrick Moloney. We can’t fault this stable favourite leading into today, he is an improving stayer whose lead-up work has been incredibly pleasing. He run a cheeky race first-up at Cranbourne before blowing out – though has taken plenty of improvement since that outing. The key to today’s run for this German import is how well he can get into the race from a not so favourable barrier 10 draw.